Meanness and agony, but where is love? Walt Whitman reminds me of my husband’s beloved octogenarian aunt. Let me be clear that Aunt Joann is beardless and her sense of propriety prevents her from singing the body electric, at least in public. But like Whitman, she’s relevant. Her manners, language and habits may be of a different time, but she lives, vibrantly lives, in 2011. Over 100 years after his death, Whitman is perhaps more relevant than any poet living today. What other poet has his own Levi commercial and had a supporting role in a recent presidential scandal? Convulsive sobs from young men at anguish with themselves—Anthony Weiner, Mark Sanford. Mother misused by her children, dying, neglected—Brooke Astor. Wife misused by her husband—Maria Shriver et al. And so on. The only image I can’t fit to our times is the famine at sea, and a little poking around on the web hasn’t yielded the historical reference. Granted, my knowledge of Whitman is limited, but the poem seems unusually dark for him. We think of Whitman recording America singing, not America abusing itself. Part of the uncharacteristic heaviness of the poem is that there is no call to redress the wrongs, no resolve to help the victims, no retreat to nature as an antidote to man-made evils. The poet just sits and observes, an indifferent god or one who feels but does not intervene. Furthermore, the poet seems as fascinated by his own act of observing as by what he observes. I sit are the first two words of the poem and the second to last line is syntactically twisted to emphasize his seated posture: I sitting, look out upon. Is he paralyzed by the inhumanity, overwhelmed? Is the “I” communal? Is he including his readers in the guilt of inaction, of seeing and hearing but remaining silent? Is he giving a job description for writers? Is this what poets and writers do, observe and report? Whitman did work as a journalist for much of his life. I posted this above a metro stop in Bethesda, a few blocks from the site of the horrific Lululemon murder. 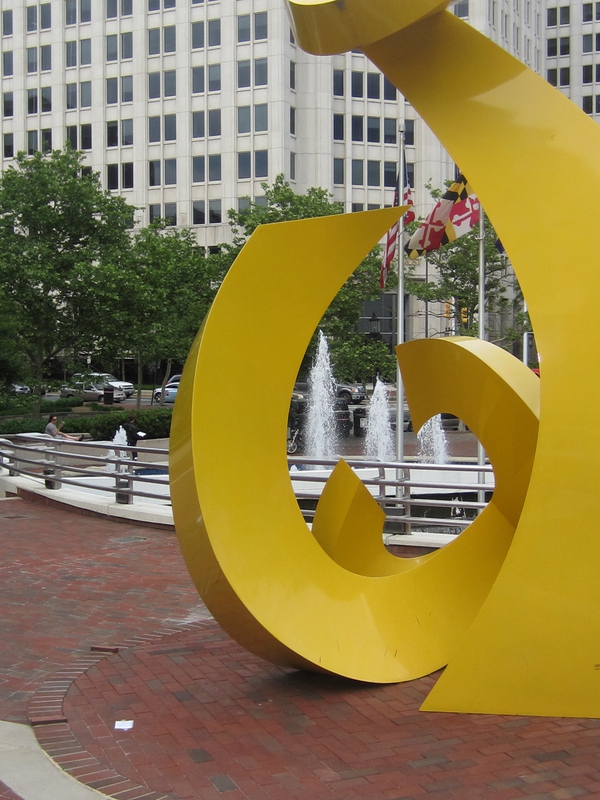 I was visiting my mother, another vibrant octogenerian, and rolled my suitcase around downtown Bethesda as I waited for her to pick me up. Sitting outside a bagel shop, I listened, very Whitman-like, to young men inside argue about the Arab-Israeli conflict. I watched as a homeless man approached a very large French couple a few benches down from me. They pretended they didn’t understand what he was asking for. (Do they not have homeless people in France? Or do unshowered, bedraggled men with opened palms often approach strangers in their country merely to ask for directions or a book recommendation?) I was up from the bench to help but a young girl reached the homeless man before I did. “Hey, Warren, do you remember me?” she asked. “I walked by you last week and you asked me for help and I felt really bad that I only had a dollar to give you. So here,” she said, and she pressed a folded-up $20 bill into his hand. They embraced. A few days ago the shop re-opened with a beautiful stained glass window “love” above the store. So it’s a like a church now, a church built on the remains of a martyr or a church that marks ground for love and not for evil. A sign doesn’t stop evil, just as a poem doesn’t end meanness and agony, just as $20 doesn’t give a man a home. Love is just the only viable response. 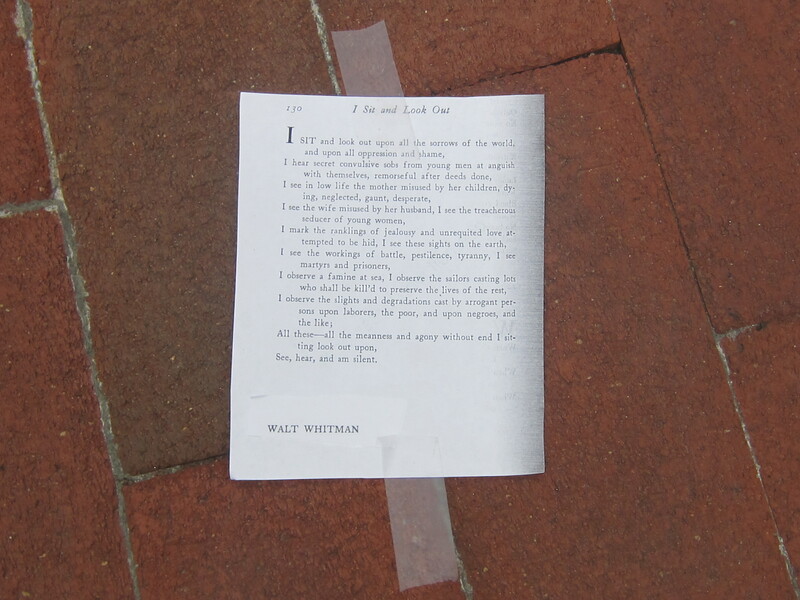 Whitman seems particularly popular these days on the internet with artists, students, musicians, and aspiring filmmakers. Hundred of youtube videos exist featuring Whitman’s poems, but I like this one of playwright and performer John O’Keefe reading an excerpt from “Song of Myself.” The man’s perspiration is alarming, but you get a great sense of Whitman’s exhuberance, his rhythm and musicality.